Wait! There are How Many Calories in an Apple? Home nutrition Wait! 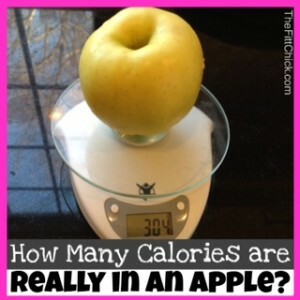 There are How Many Calories in an Apple? Apple season is here! That means my fruit bowl is filled to the brim with all different types of green and red apples. Everyone knows that apples are healthy, but do you know the nutrition content and calorie count? It’s hard to say exactly how many calories are in an apple because apples vary in size and variety. My apple was 304 grams. This 304-gram apple was a medium sized apple, and is a surprising 158 calories. I don’t know about you, but I used to always reach for the largest “Pink Lady” apple I could find, which can be anywhere from 200 to 300 calories. One of the key ways to weight loss and maintaining a healthy lifestyle is through portion control. Research has shown that Americans often underestimate how many calories they are consuming each day by as much as 25%. I always tell clients to weigh and measure out their foods so they will know exactly what they are eating! The difference between a small and large apple on a daily basis could be the reason you lose or gain weight at the end of the week. Apples are a healthy and FittChick “approved” food source. But just like many nutritious foods, too much of a good thing can lead to a few extra pounds you were not planning on. Check out this post on 10 Reasons to track your food! The Crunchy Snack You’ve Been Searching For! How to Feed and Fuel Young Athletes! A Cereal Perfect for ANY Diet!